The 1963 Topps Beverly Hillbillies trading card set highlights the popular 60s television series with color photos and humorous quotations. 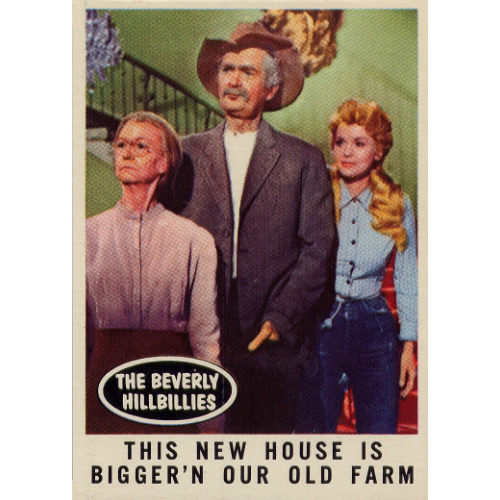 A very popular set among collectors of television inspired cards, the checklist is a modest 66 cards. The front of each card is a production still from the show (in color despite the series being in black and white). The reverse of each card includes a mock dialog between characters. Top quality cards from this set command a pretty solid price so collecting all 66 cards, in excellent condition, can get pretty costly but cards are frequently found on eBay and at trade shows. Our checklist below includes all of the cards in this series and can be searched, sorted, or printed. 1 People in Californy sure dress funny. 3 Don't fret, we'll get you a new slingshot for Christmas. 4 There ain't a possum in all of Beverly Hills! 6 You stop beating up Jethro, hear? 7 It's great for cracking walnuts. 8 Strangest looking prison bars I ever saw. 9 Now, no more rassling, you two. 10 Granny, I'm growing my own leopard coat. 11 That telephone pole makes good fire wood. 12 But Granny, you're too old to slide down the bannister. 15 Ow, I hit the wrong nail!! 16 Elly May and Jethro. 17 We give up - Where is the water pump? 18 I gave him a bath and he just wrinkled all up. 19 Got any spare parts for a 1921 touring car? 20 The folks at this drive-in ain't watching the movie. 21 Why can't I take my pet for a walk? 23 These Californy bathtubs are a bit snug. 24 I'd be a good executive - if I knew what "executive" meant. 25 Elly May, stop putting the wash in the television machine. 26 This car's been in our family for 40 years! 27 Why'd they put a harp in this wood box? 28 We get 10 gallons per mile. 29 We use this for washing & the outside pool for rinsing. 32 So that's a bikini bathing suit!! 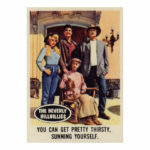 33 You can get pretty thirsty, sunning yourself. 35 They're fun, but not much for hunting bears. 36 Ain't they ever seen a convertible before? 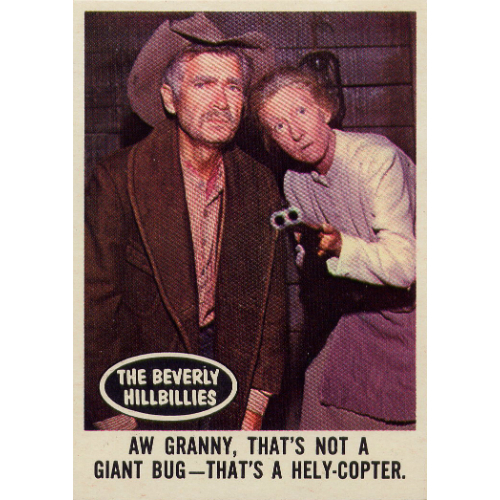 37 Aw Granny, that's not a giant bug - That's a hely-copter. 38 Elly May, it's easier to iron my coat after I take it off. 39 It musta been a pretty sick chicken for such a bandage. 42 Magazines are great for swatting flies. 44 Everybody got Cadillacs, but we got something special. 47 Get fresh with me, will ya! 48 Race you up one of them palm trees. 49 Maybe we could get jobs as models. 50 We can always throw darts at it. 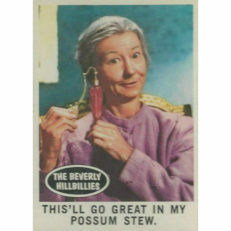 51 This'll go great in my possum stew. 52 Today I bagged 2 squirrels and a mink coat. 53 Spread-out, you two you're scrunching me! 55 We're going to a fancy nightclub. 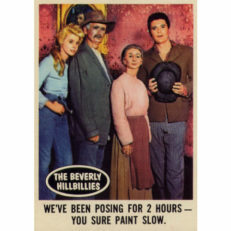 56 Elly May, Jed, Granny and Jethro. 57 Jed, you look fine in sports clothes. 59 That "One Way" sign is wrong - It's pointing the other way. 60 When my date's car stopped, I fixed the motor. 62 We've been posing for 2 hours - You sure paint slow. 63 When that ice melts we're in for a flood! 65 You mean some people play games with these pot holders?